Want to experience authentic Christ followership? It’s the opposite of everything imaginable: love enemies, serve to lead, sit to stand, humbleness for glory, just to name a few. The key to all faith paradoxes is trust and confidence in the God who operates outside of natural laws, basics, like gravity. Grace is a paradox too. I’ve been captivated by paradox within my faith for the last three years. I can’t seem to get away from it, as though this one understanding is waiting to be fully embraced, as though I am on the precipice of really “getting it.” Something inside me keeps saying, “once this truth is broken apart, I will be stepping into the deepest places where faith, trust, hope, and love are the norm. 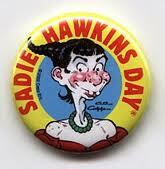 It would be a spiritual Sadie Hawkins life when those seemingly opposite behaviors would be natural. Expectations would no longer drive my emotional responses; disappointment wouldn’t overpower faith; fear would be a memory; anger wouldn’t be a useful tool to get my way; and controlling words would be unfamiliar. If I could “cast my anxieties” on Christ, there would be nothing to carry.